The Samsung Galaxy Note7 is still not official. Well, the name already is thanks to Samsung invitations that were handed out to the press for the August 2 simultaneous launch events in NYC, London, and Rio. 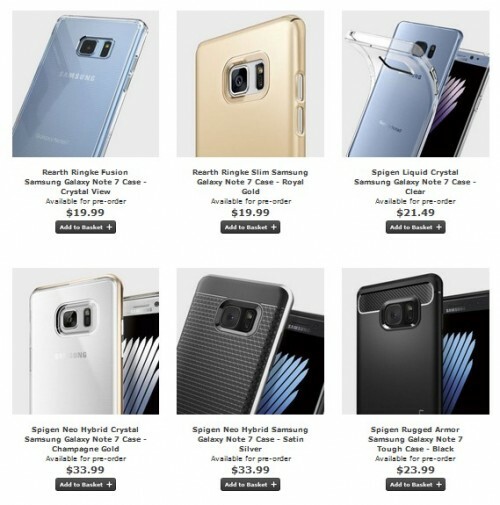 MobileFun’s UK online store has a bunch of Galaxy Note7 accessories, both official and 3rd-party, up on its site. There are flip covers from Samsung, cases from two case makers with renders of the phone in the case, and an accessory that really stands out among the others. Part No. EJ-CN930UBEGGB is listed for “Official Samsung Galaxy Note7 QWERTY Keyboard Cover – Black”. It seems that Samsung believes some number of customers would still like to have a physical keyboard experience with their Galaxy phones. There are also LED flip cover wallet cases, Lens covers, Clear view cases, and S-View cases in various colors, mostly black, gold, and blue. 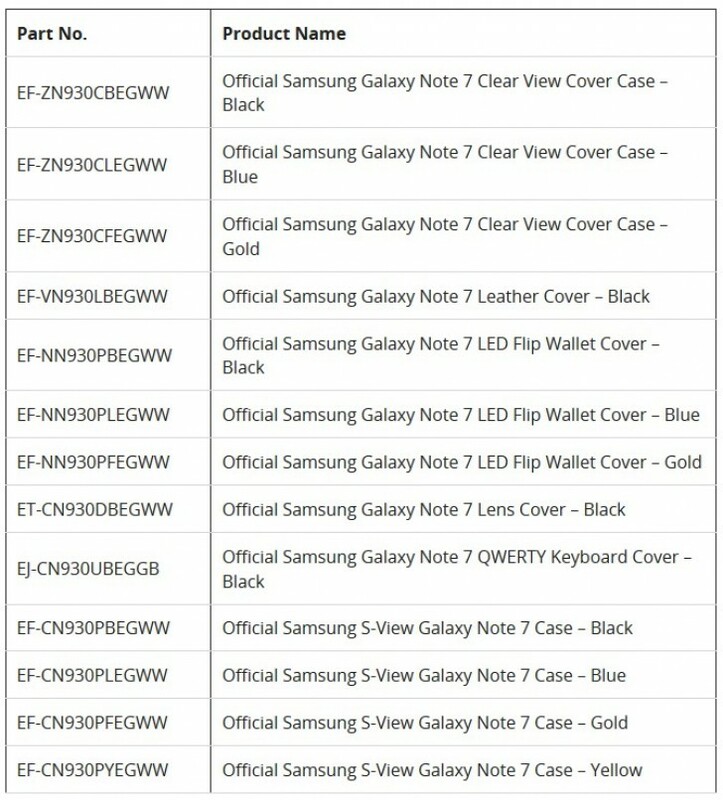 The blue colored accessories will likely match the coral blue variant new to the Note lineup this year. There’s also a yellow S-View case, which isn’t entirely impossible. I remember seeing some really random colored S-View cases for the Galaxy Note 4 and Galaxy S5 when I used to work at Best Buy. 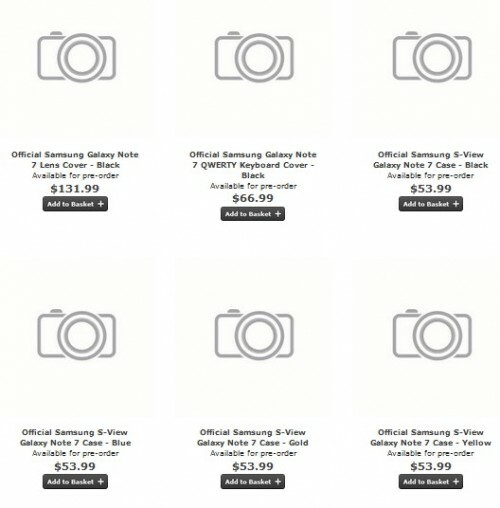 It’s worth noting that at the time of this post, there are no pictures shown in any of the various Samsung-official listings of the items on the page. But all of their item descriptions and part numbers are fully populated. We can’t wait to see what the Note7 will hold in store. The Galaxy Note7 is rumored to have an iris scanner, USB-C port, updated S-Pen with new quick actions, either a 3,600 or 4,000mah battery, 5.8 inch-dual curved, Super AMOLED display, Snapdragon 821, 4 or 6GB of RAM, and full-immersion IP68 certification like the Galaxy S7 and S7 edge have.